It’s here the 100th day of school and that means it’s time for a homework assignment! If you don’t know the 100th day of school is a pretty big deal, especially in Kindergarten. It’s a milestone that is celebrated and a lot of schools have the students do a project with 100 things. Our school asked us to make a t-shirt with 100 items in it. I talked with Eleanor about what she wanted. She debated about 100 google eyes or 100 stars or hearts but nothing seemed to fit. So I asked her what do you really like? She replied with superheroes and that’s when I got an idea. 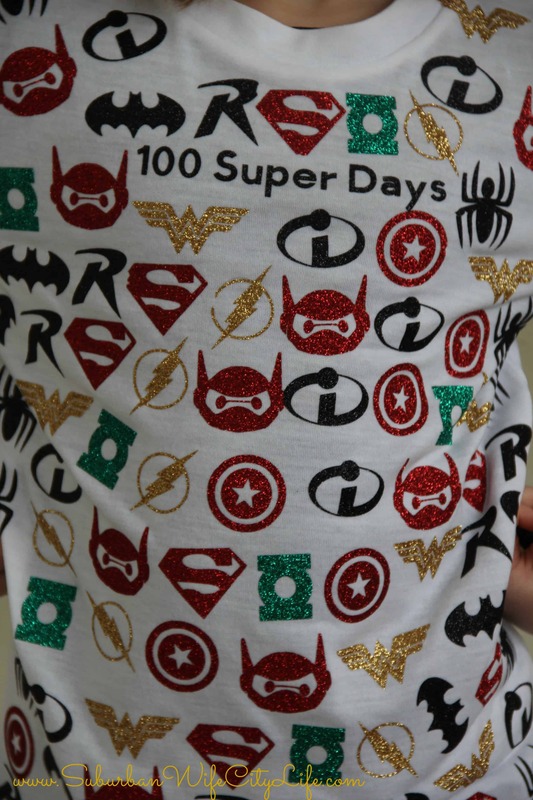 I’ve also got a few other 100th day of school shirts 100 T-riffic days, 100 Sweet days. I bought a white tshirt, and made sure to wash it before I did anything. Then, I pulled out my trusty Cricut and got to work finding the logos and cutting them out with iron on vinyl. Tip: Make sure the logos aren’t larger than 1 1/2 inches each. It was tricky to fit all 100 on there. 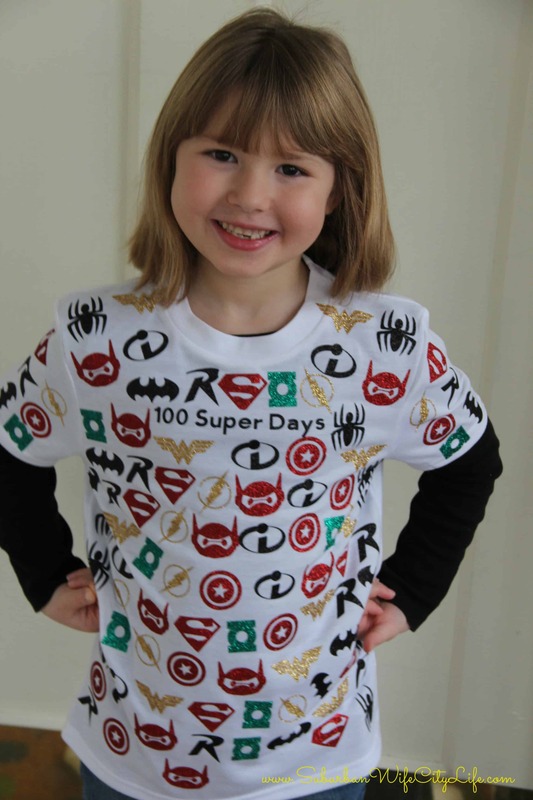 In the end she chose: Wonder Woman, Superman, The Flash, Spider-Man, Big Hero 6, Captain America, The Incredibles, Batman, Robin and The Green Lantern as her 10 superheros. 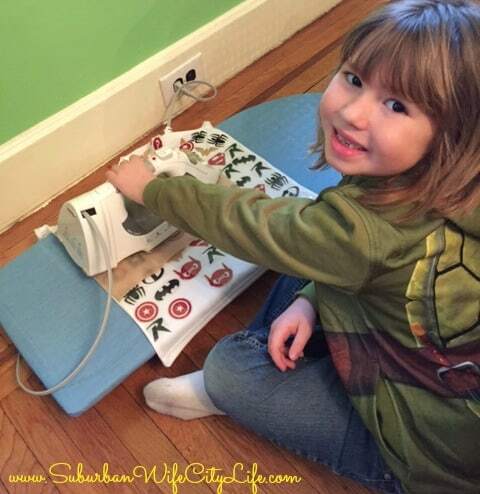 She worked hard to arrange and iron on all 100 of the logos and was so proud of the finished project. I had a difficult time letting her arrange them, but kept reminding myself this was her project and that it would turn out perfect in her eyes. I have to say I think it looks pretty perfect and to see how proud she is of it makes it even better. Does your school celebrate the 100th day? What types of projects did you do? Hello I love the shirt! and want to make it for my son. Can you tell me where you found the logos? or link them for me please? i am new to the cricut world so no idea where to start and its only my second project. I’m sure it’s going to be awesome. Make sure you share a photo! I searched for the pngs or svgs of the logos and then uploaded them. I hope this helps.